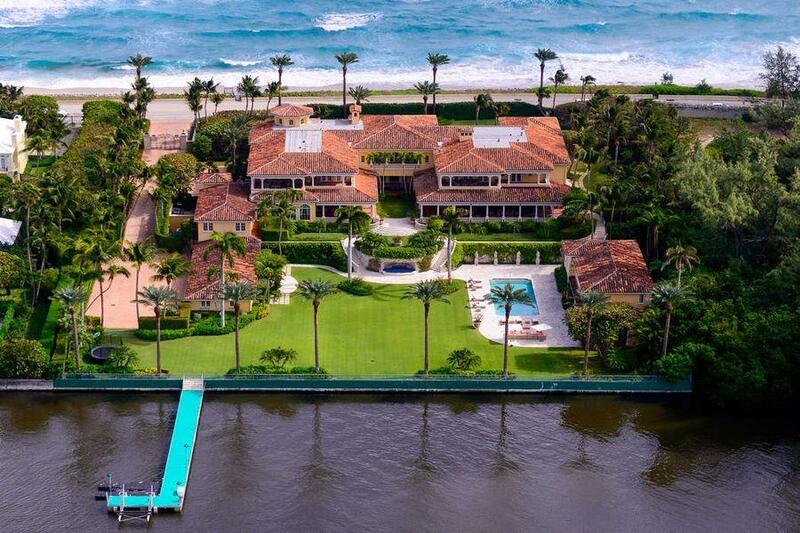 I consent to luxuryresortportfolio.com collecting and storing my data from this form. 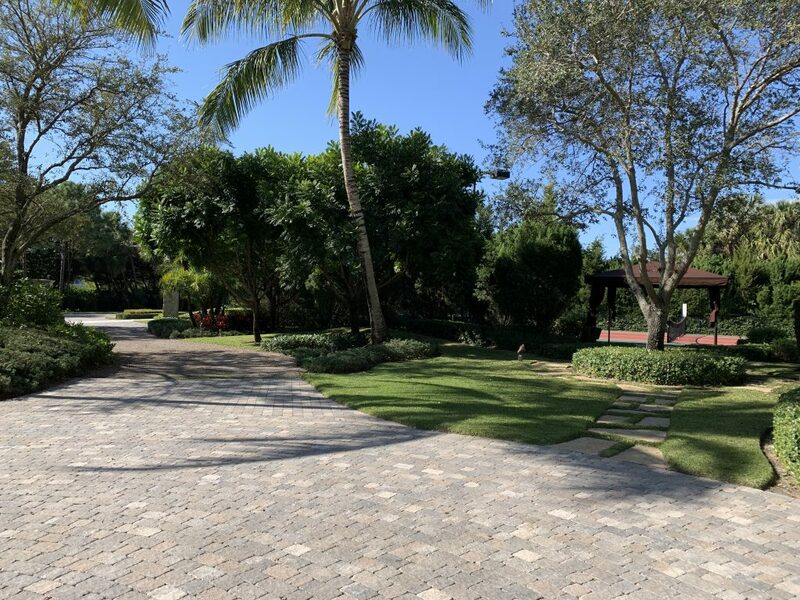 Stone Creek Ranch real estate is one of the Gold Coast of South Florida’s grandest and most exclusive gated estate enclaves providing residents with privacy and a taste of the privileged Palm Beach lifestyle. 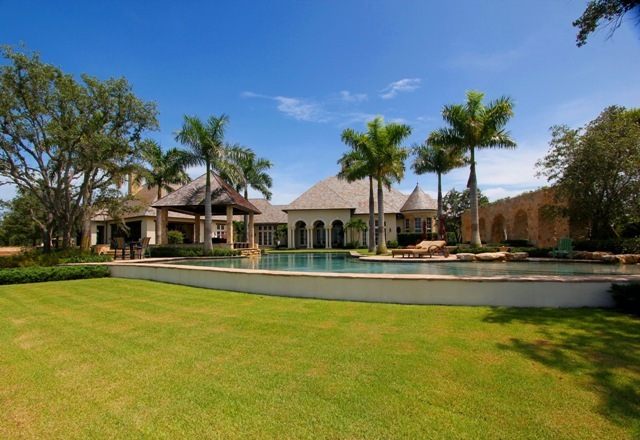 Neighboring some of the preeminent guard gated communities of Boca Raton luxury real estate, the exclusive estate enclave of Stone Creek Ranch is a few minutes distance from the elite Boca Raton Country Club homes of St. Andrews Country Club, Royal Palm Yacht & Country Club, Addison Reserve, Woodfield Country Club and Mizner Country Club as well as the exclusive gated estate enclaves of Le Lac, Long Lake Estates, The Sanctuary and The Oaks at Boca Raton. 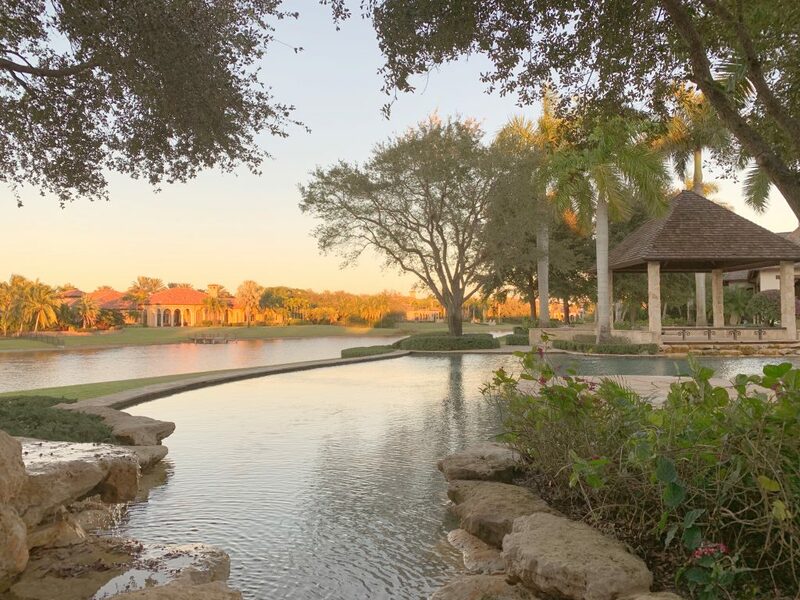 Community: Developed by Kenco Communities, the magnificent Stone Creek Ranch homes for sale in Delray Beach are nestled amid 187 acres of picturesque verdant vistas, striking lush landscapes and expansive shimmering lakes. 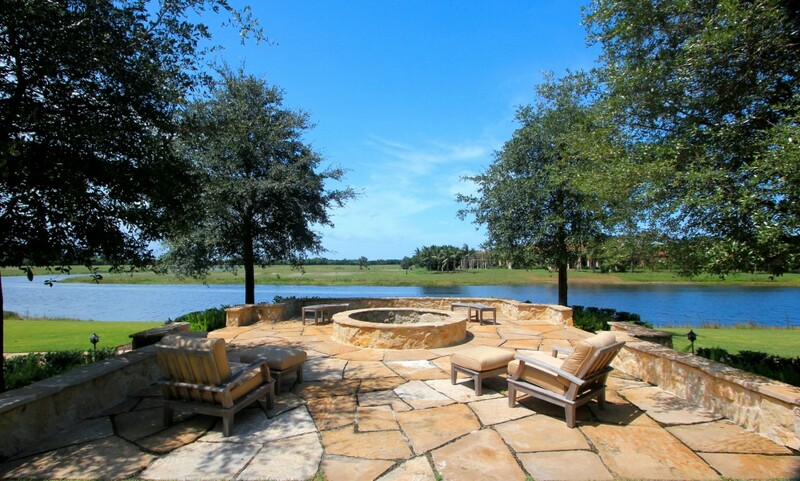 Stone Creek Ranch is the ideal setting for what will ultimately be 37 magnificent custom built estates. 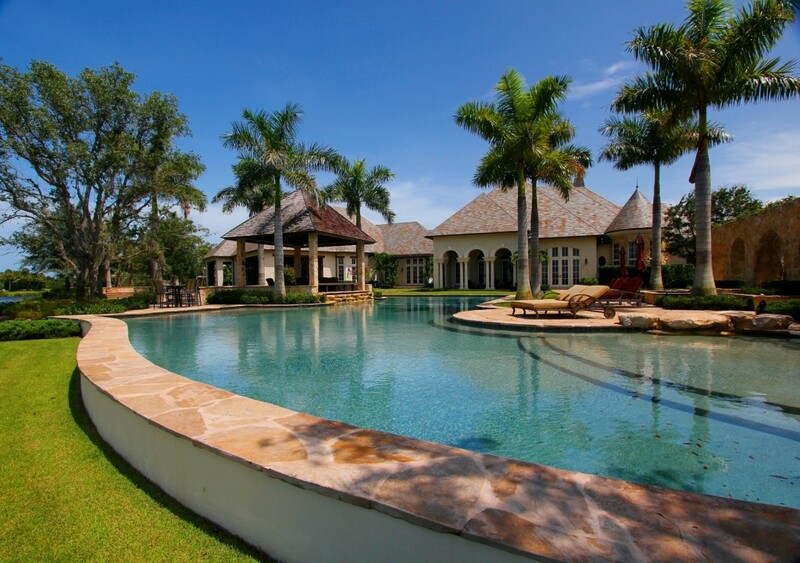 The fortuitous homeowners that reside in Stone Creek Ranch, which presently include a register of homeowners from world acclaimed Professional Athletes and Owners of Professional Sports Teams to Global Entrepreneurs and Fortune 500 Corporate CEO’s, luxuriate in custom commissioned one-of-a-kind private compounds that are perfectly set on two and a half-acre or larger opulent lake front home sites. Stone Creek Ranch’s renowned team of custom builders: Charlse – Watt Estate Homes, Courchene Development, Frankel-Infinity Custom Estates, Kenco Custom Homes and Terence Cudmore Builders have created masterpiece residences from over $3 million to more than $15 million. 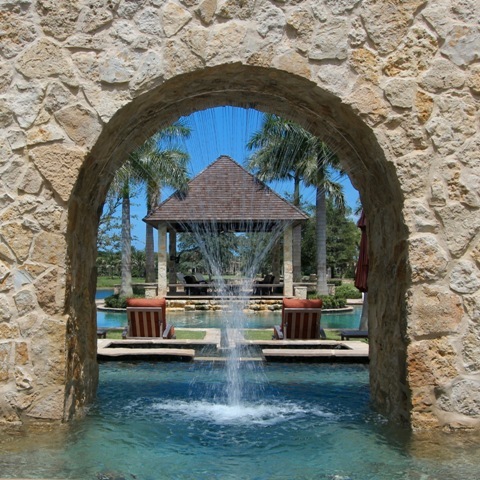 Upon arriving at Stone Creek Ranch, the stately private entryway leads to a manned and guarded stone gatehouse. Proceeding through the tree-scaped drive your guests are embraced by the community’s signature landmark, a dramatic, triple-arched stone bridge. 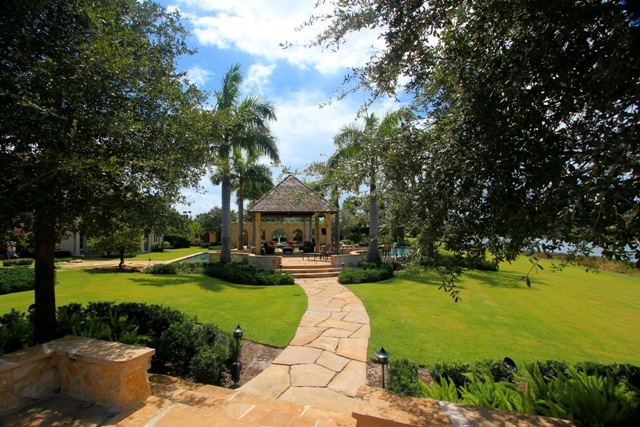 Scenic walking and biking paths that are three miles long surround the Stone Creek Ranch real estate providing spectacular water views. Property: Nestled in one of the most exclusive gated estate enclaves along the Gold Coast of South Florida, discover a palatial French Country Estate that emanates an unparalleled sensation of grandeur in Palm Beach County’s Stone Creek Ranch. Surrender to the tranquility that surrounds this idyllic haven of luxury from the resplendent grounds adorned with lush exotic foliage and stone embellished enchanting ponds to the hypnotizing sounds of the cascading water-falling aqueducts creating a symphony of aquatic cadence. 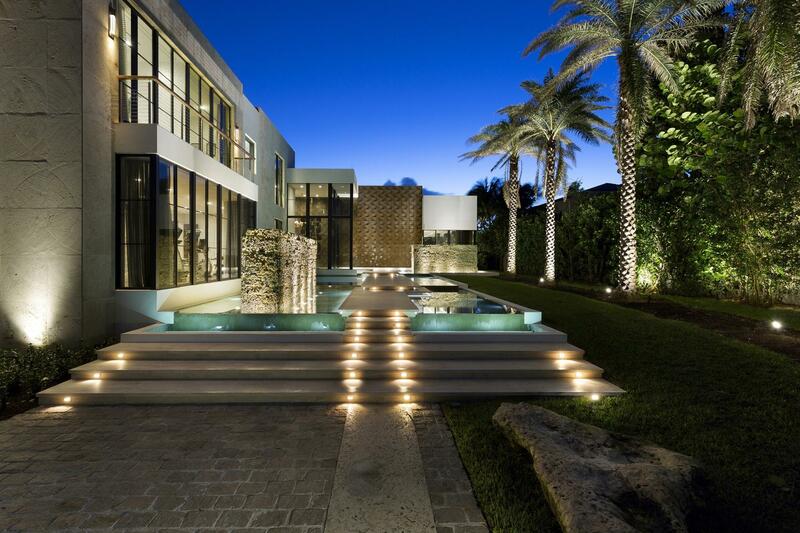 Revel in an architectural and sensory delight that conjures an unforgettable ambiance that most can only imagine. Residence: Exclusive to Stone Creek Ranch, the prestigious celebrated lake front enclave in Delray Beach, this palatial rural Provence inspired masterpiece boasts phenomenal, first-class, 5-star, resort inspired amenities amidst a romantic enchantment that lies within a bucolic paradise. 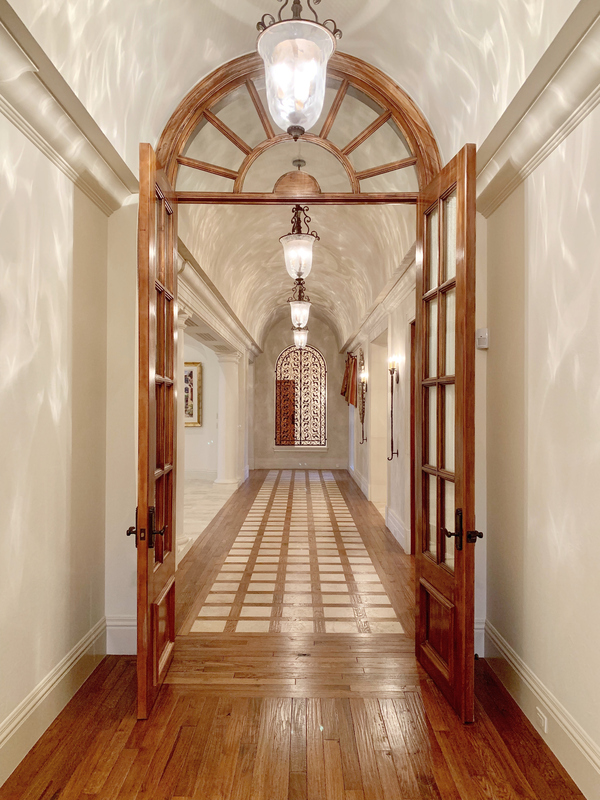 World renowned architect Carlos Martin and nationally acclaimed custom home builder Frankel Estate Homes designed the exterior of this Stone Creek Ranch estate to embody a classic European aesthetic emblematic of traditional rustic French architecture. 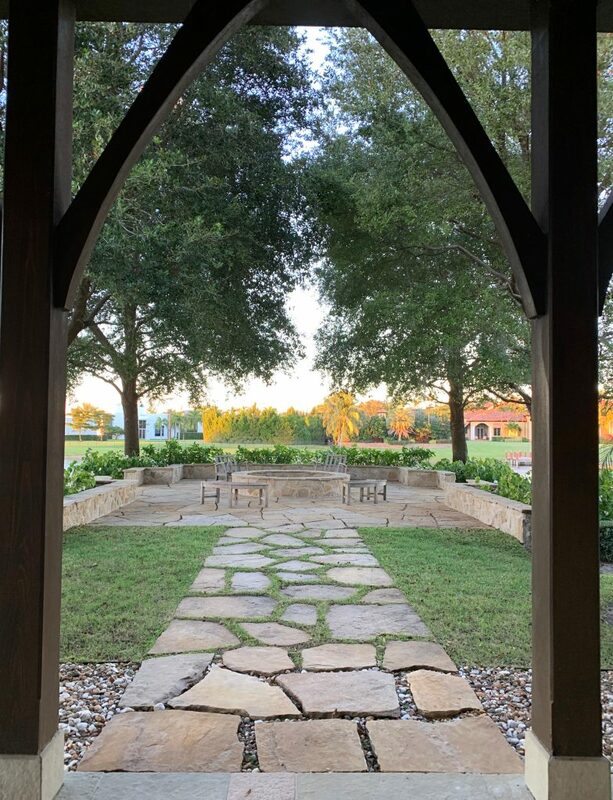 Purchasing and enjoying Stone Creek Ranch real estate is the finest way to spend time with family and friends, generating memories of a lifetime. This timeless residences immediate impressions are both alluring and spectacular… and are certainly nothing short of magical. Arrival: Designed to impress guests with a welcoming presence of luxury and privacy, one enters the sculpted grounds through twin hand crafted stone columns topped with etched glass gaslight lit lanterns along a winding secluded gravel laid road that crackles beneath the wheels, all the while the residences splendor is hidden from sight by lushly landscaped burmed elevations created by distinguished landscape architect Krent Wieland Design. 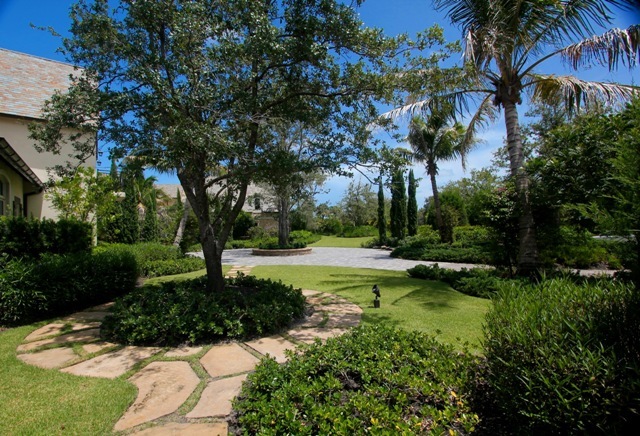 Upon arriving at the estates circular custom paved formal drive one is greeted by the subdued elegance of meandering glistening ponds and quiet romantic covered loggias which create a serene oasis that lead entryway to the residences stately arched, wide planked mahogany door fitted with iron grommet finishes that opens to reveal a striking yet intimate entry gallery. 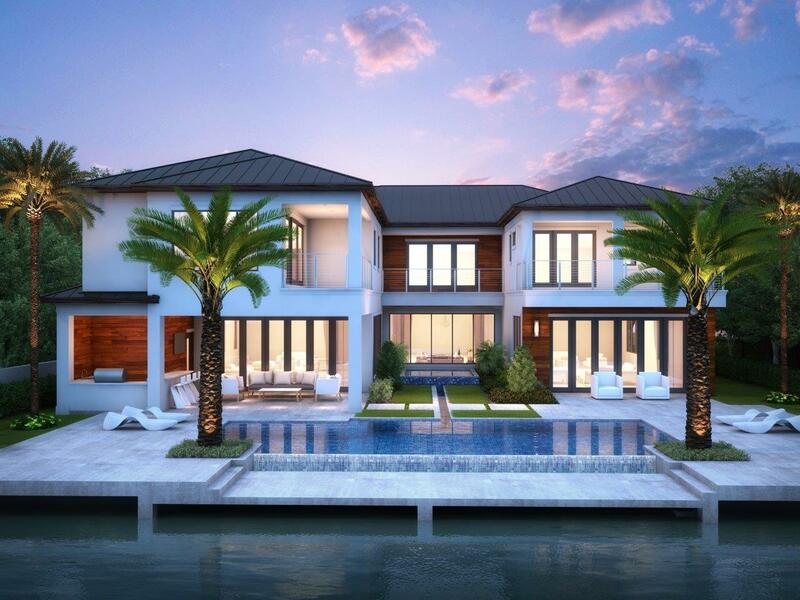 First Floor: The estates inherent design yields an element of functionality that lends consideration to life style, family and dreams with lavish yet welcoming spaces and a floor plan that transitions flawlessly. This extraordinary estate offers timeless craftsmanship from the Haifa imported stone floors set in a lattice pattern fitted with wide plank / hand scraped Oak inlays seven inches wide to the limestone hand plastered walls and barrel vaulted or coffered ceilings with decorative beams of Cypress that are a consistent theme throughout the opulent first level interiors that pays homage to the Architecture indicative of European heritage. 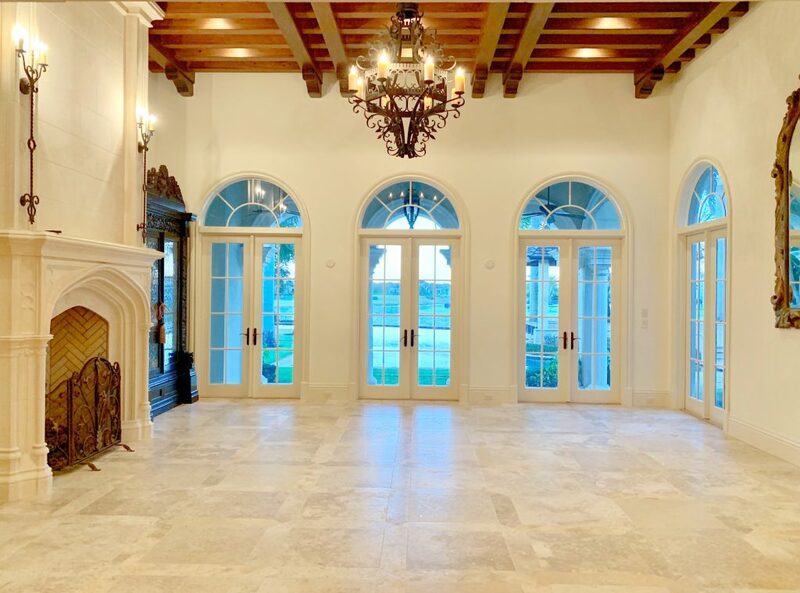 Formal Living Room: The expansive formal living room exudes a sophisticated ambiance with regal undertones and provides a reserved area for grand entertaining with an exquisitely designed space built from the finest imported materials. 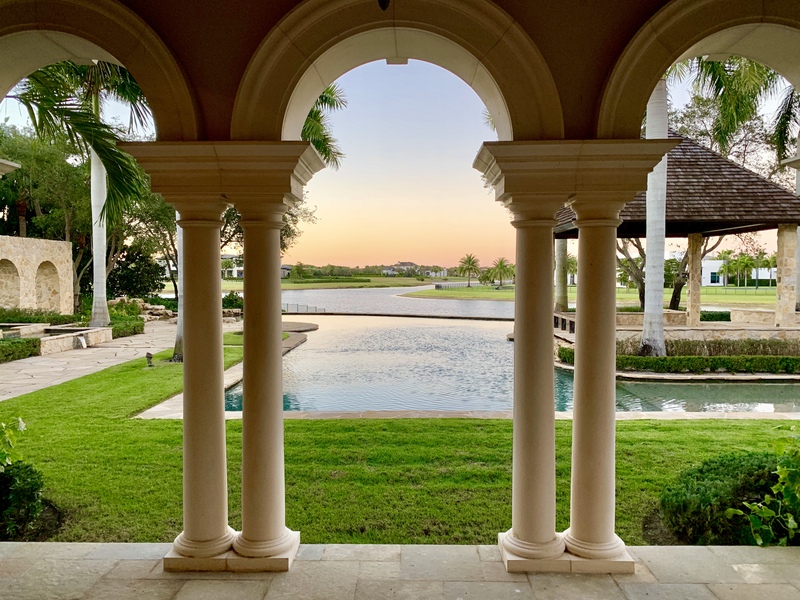 A wall of windows frame the pastoral views of the estate’s expansive resort inspired pool and the lush landscaping that envelopes the grounds through a row of triple arched glass French Doors. The massive limestone fireplace with inlays of imported stone fitted in a pattern of herringbone and marble mantel stretches to the dramatic Cypress wood beamed ceiling. Library & Office: Strong spacial relationships and harmonious volume have been successfully integrated into the impressive symmetrically structured bi-level gentleman’s office that mirrors the grandness of the stately formal living room. 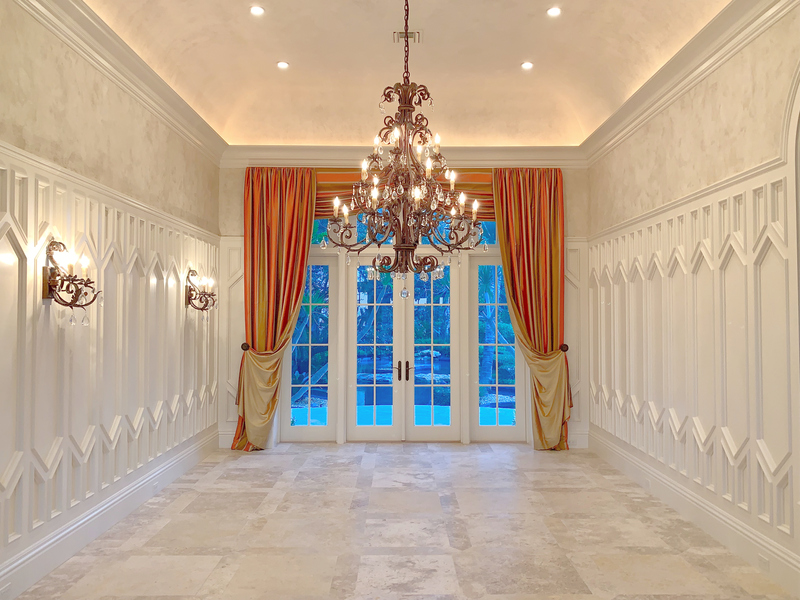 The rooms sophistication and comfort is reminiscent of an English parlor with hand carved wood paneled walls, imported stone fireplace and a second level wrap around library with wood beams reaching to the ceilings arched apex. Formal Dining Room: Celebrate special occasions and take dining to a new level of luxury in this verdant view filled formal dining suite boasting dramatic garden views that provides a lovely setting for formal entertaining and an intimate atmosphere for welcoming guests despite its large scale. 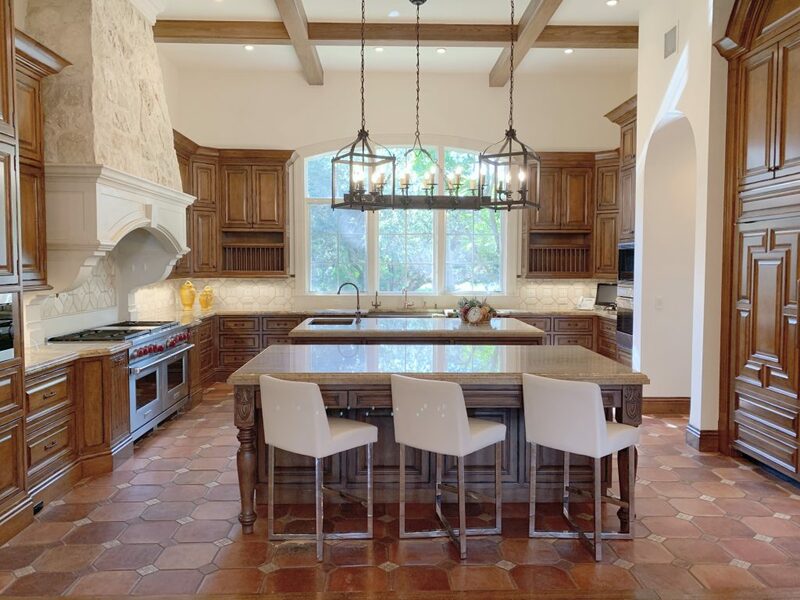 Gourmet Kitchen: French country-side inspired kitchen with hand painted tiled flooring was designed with the true gourmand in mind and every convenience reminiscent of a grand style of living. The chef’s kitchen is a gourmet delight and the perfect spot to create a family feast or cater an elaborate party with a pair of triple bull-nosed granite topped preparation islands, dual copper inlaid farmhouse sinks, limestone hooded range, an abundance of Maple wood carved cabinetry, twin dishwashers, vegetable steamer, pot-filler faucet, Miele coffee / espresso / cappuccino maker and a full array of top of the line appliances. Breakfast Room: The breakfast room offers an intimate space for family gatherings with panoramic lakefront vistas. 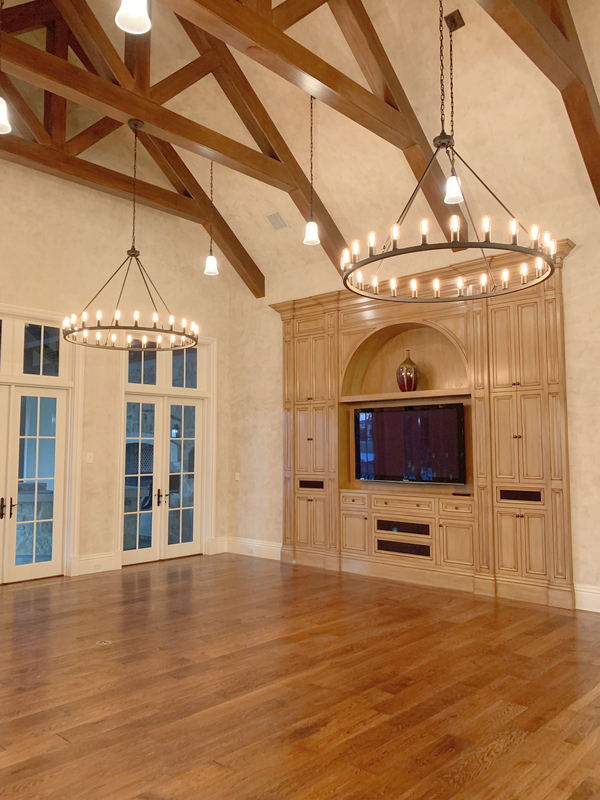 Family Room: The family room boasts an inherent sense of grandeur and is reminiscent of a classic rural villa with its’ wide plank scraped floors, limestone plaster finished walls and vaulted ceilings adorned with Oak wood beams. 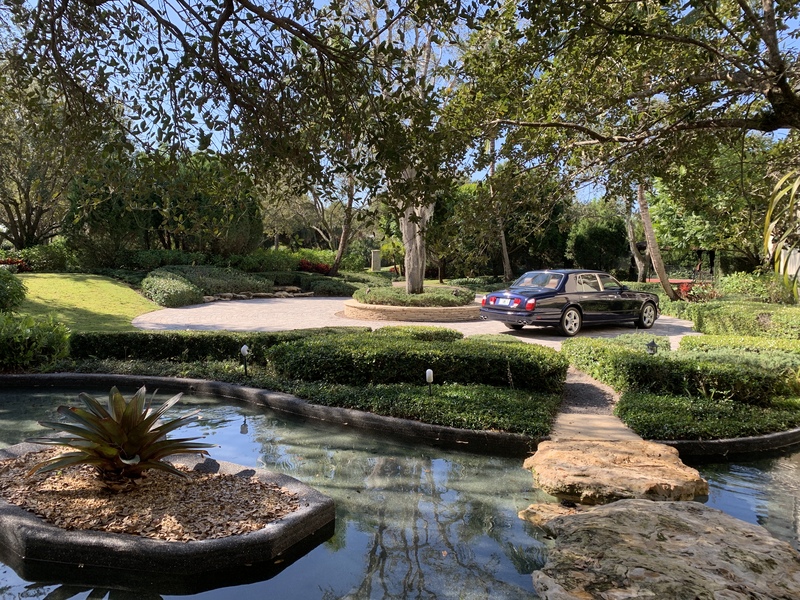 The expansive room is set in an open air layout abounding with triple French Doors that lead way to one of the compounds rear entertaining loggias replete with al fresco summer kitchen and the sparkling lakes of Stone Creek Ranch beyond. 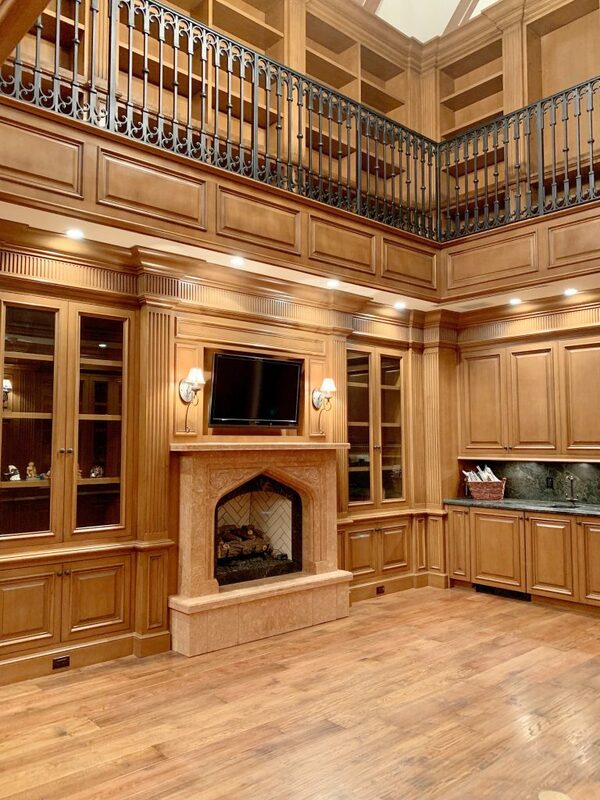 The estates informal socializing area in front of the artisan crafted entertainment center of light caramel finished woods with a hand applied antique rub lends itself to both grand entertainment and casual family gatherings. Master Suite with Individual Baths: The estates lavish master suite suggests a regal sophistication, softened by the warmth of a gracious welcome highlighted by a dome hand painted ceiling. 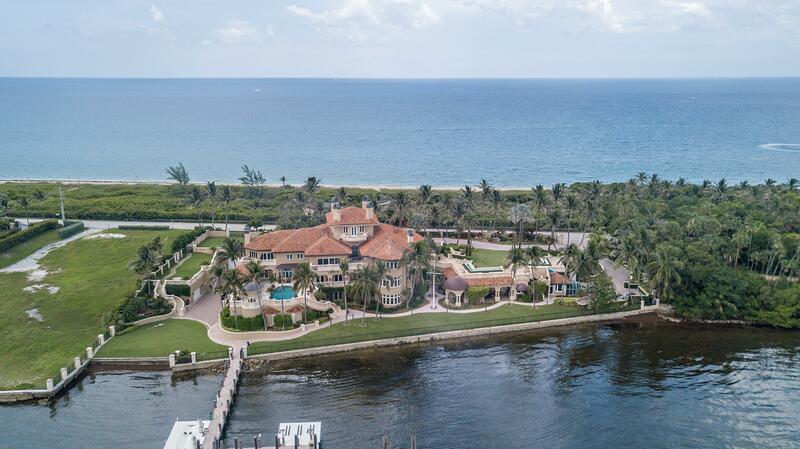 Discover the romantic enchantment that pervades this capacious masterful wing and indulge yourself in a decadently grand master suite adorned with breathtaking unobstructed panoramic lake views and sumptuous amenities befitting a residence of this caliber. Step down to a romantic sitting area anchored by crackle finished Oak and Mahogany wood built-in cabinetry and a limestone fireplace that warrants an inherent sense of warmth and intimacy. Luxuriate in amenities such as a morning kitchen with Miele Espresso bar and dual custom built-in closets, each fitted with bevel edged onyx topped oval island dressing tables that add a touch of glamour. The grandly scaled individual his and her master bathrooms feature out of this world sumptuous appointments from mother of pearl inlaid sinks to a claw footed ladies soaking tub and gentleman’s multi-jet steam shower. 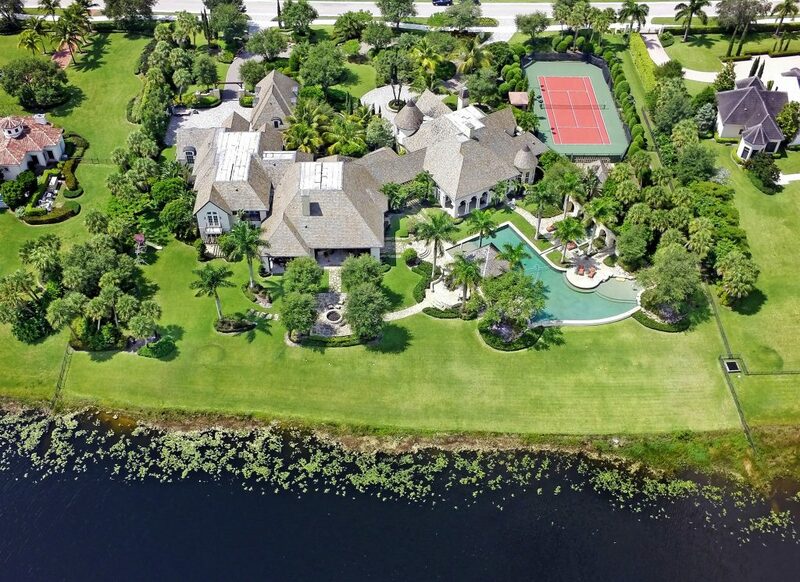 A true serene haven of tranquility. 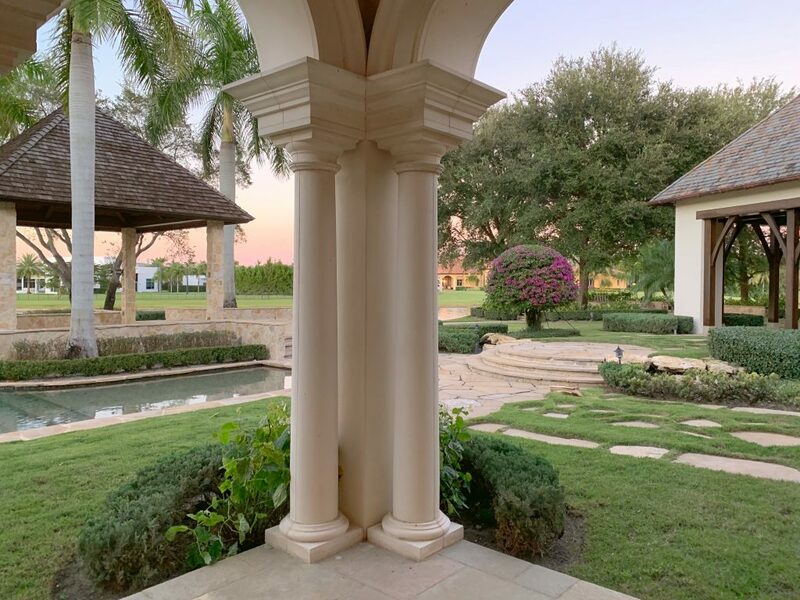 Master Spa Retreat: Surrender to the tranquility of this blissful indoor / outdoor reflective oasis with a personal massage or relaxing spa / hot tub… all the while soothing the days tensions away with the fountains calming water-falling Zen rhythms. 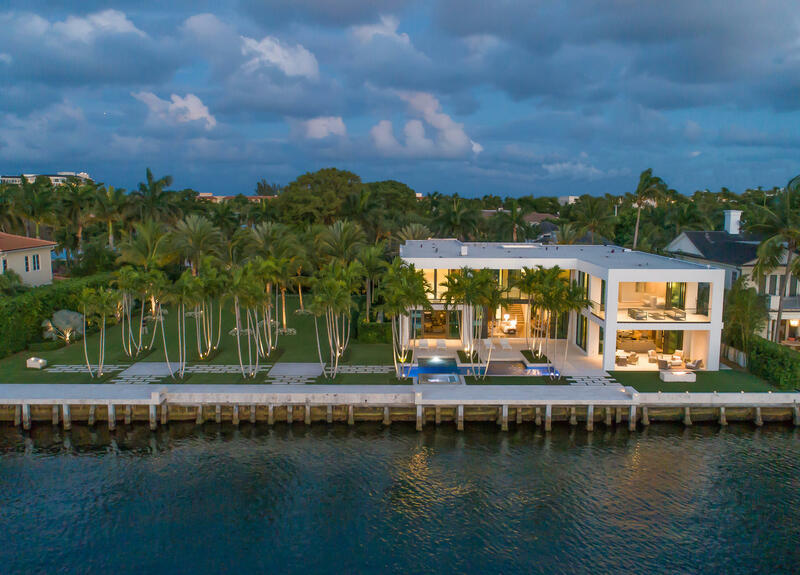 Second Floor: The upper level is embellished with four additional elegant bedroom suites each adorned with individual private baths and spectacular resort inspired views that warrant a natural state of harmony. A Loft, Game Room and Arcade complete this level. Guest House: The two story guest house in this great estate is comfortable and private and contains a full bath, convenience kitchen and laundry. 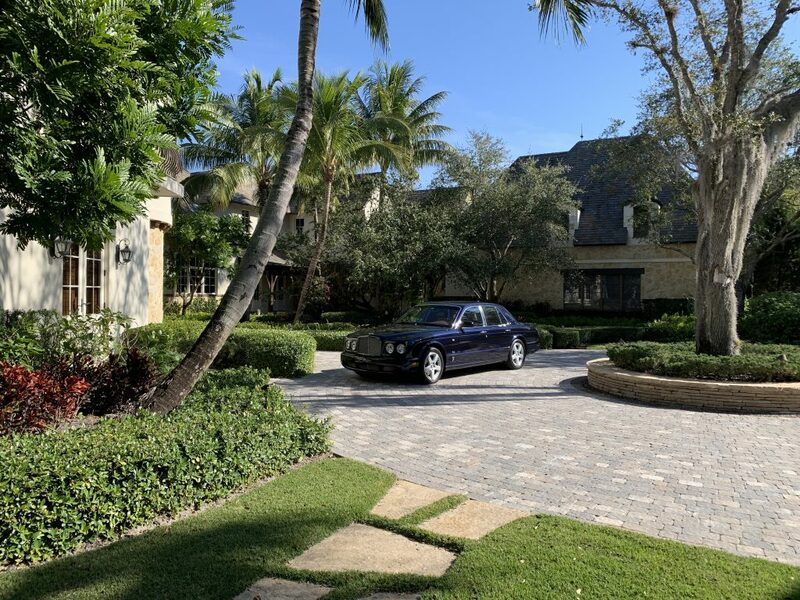 Motor Court: The open air courtyard is a wing on to itself designed with six indoor automotive garage bays surrounded by arched carriage house Mahogany wood doorways. Pub & Billiard Room:A full service bar that would rival the finest European pub or exclusive gentlemen’s sporting club, a billiard area with triple French Doors affording sun-splashed lakefront views and custom built maple wood cabinetry with no less than four large flat screen televisions. Impeccably finished box beam wood ceilings and old world rustic flagstone flooring anchor this capacious entertainer’s paradise. 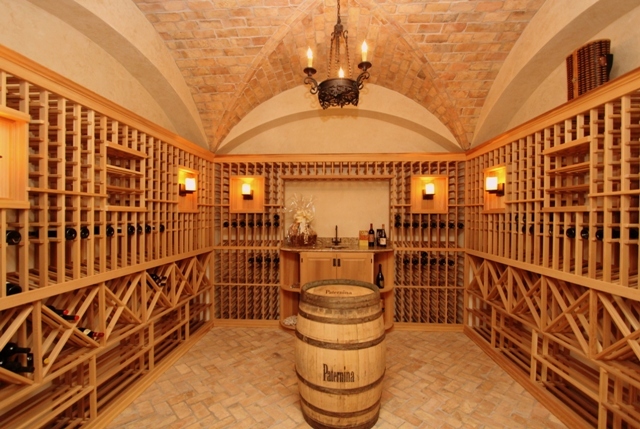 Wine Cellar: The temperature controlled wine cellar was specifically designed to showcase the homeowners’ private collection of wines and rare spirits. The below ground level wine cellar and tasting room affords a timeless appeal with old world brick inlaid floors and arched vaulted ceiling. 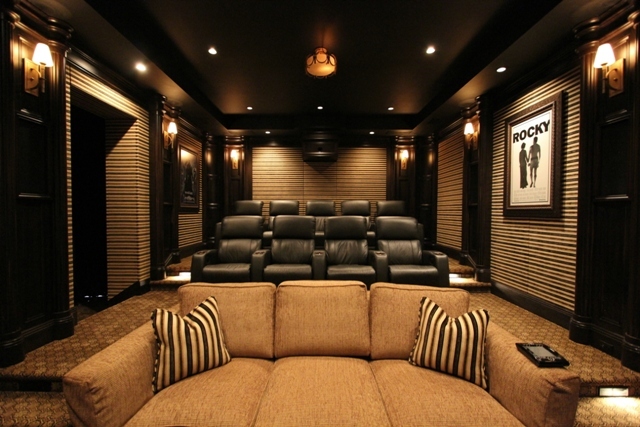 Home Theater: Relax in the professionally designed Hollywood style screening room that stretches the realm of escapism with three tiered / motorized stadium seating for twelve, a 120” audio enhanced perforated movie screen, acoustic paneled walls, electronic draperies and a fully stocked snack center. Exercise & Fitness Room: A state of the art fitness center that overlooks the grand lawns of the estate. Arcade & Game Room: Located on the upper level and features a visually stunning design that is consistent and uniform throughout the estate. 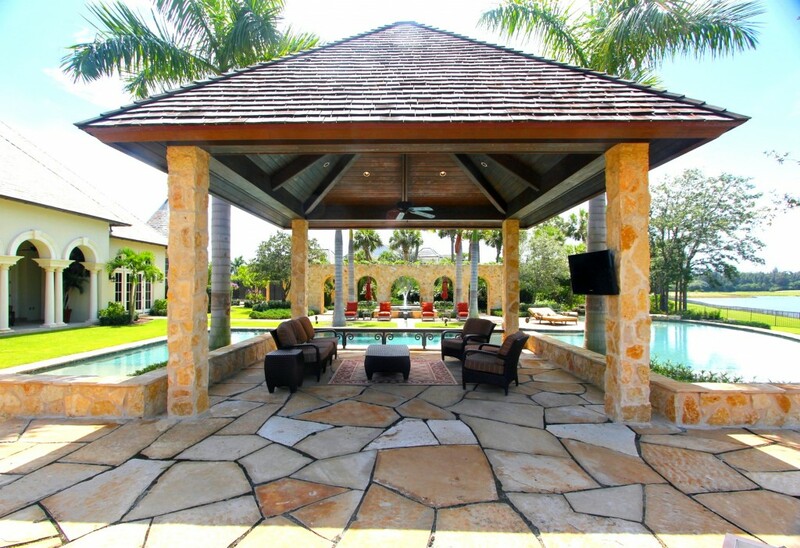 Outdoor Entertaining Loggias: The estate is well appointed with all the open-air accoutrements perfect for outdoor entertaining that flow seamlessly from one area to the other. 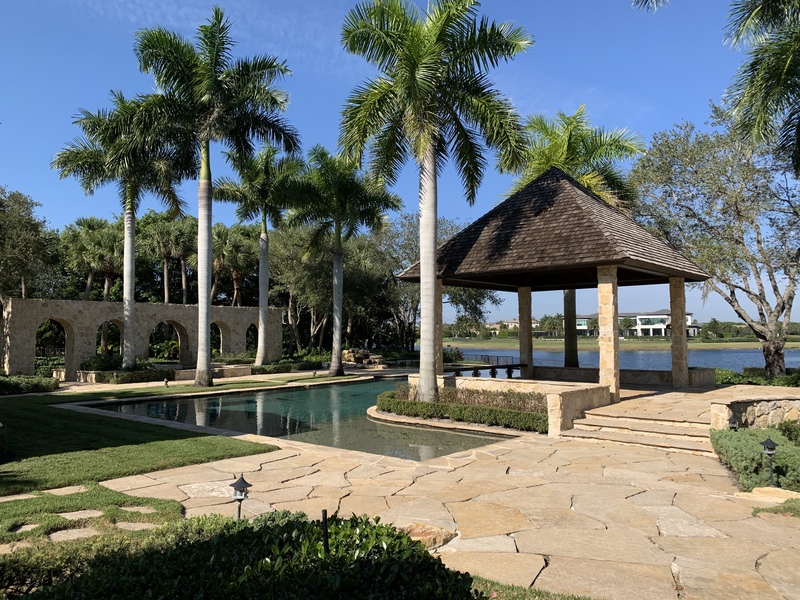 The exterior of the compound consists of numerous covered loggias, sun terraces, a lake front stone encased fire-pit, poolside covered gazebo and a chefs’ dream al fresco summer kitchen replete with full service bar and pizza oven. Resort Pool: Revel in a resort inspired entertainers paradise infused with a superior reign of luxury, leisure and lifestyle. 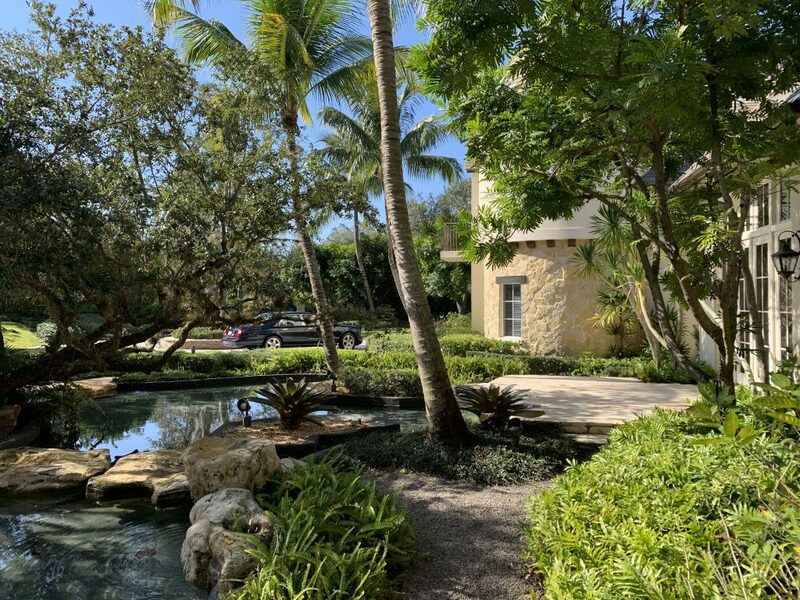 The hotel-like swimming pool is a cool oasis in this spectacular landscape with a waterfall flowing aqueduct that drains into one of South Florida’s largest residential pools. Entering the lake front grounds is a truly thrilling experience. 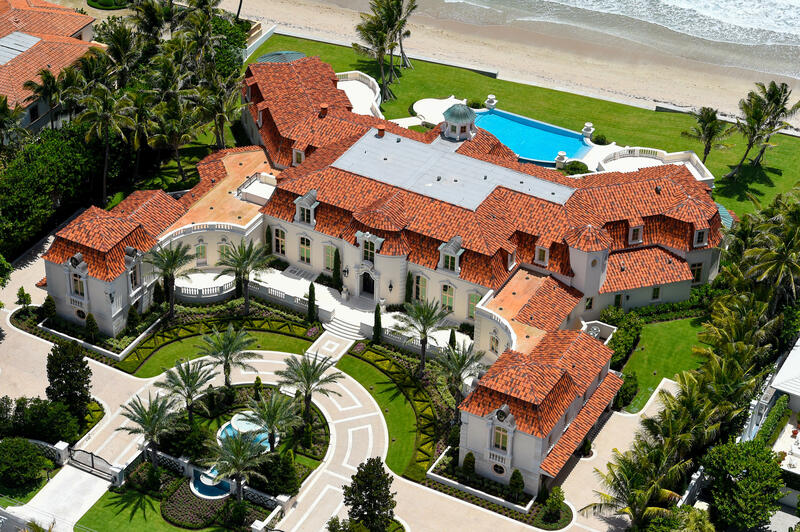 Immerse yourself in breathtaking beauty. 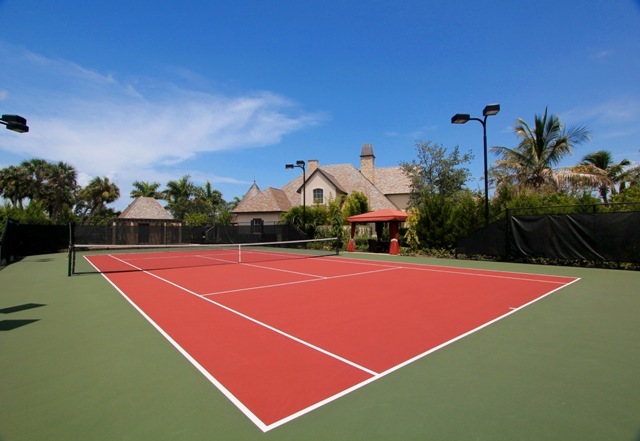 Tennis Court: Spend the afternoon or evening challenging guests to championship play on this fast-drying tournament quality surface replete with precision optic illuminated lighting… then relax under the courtside canvas topped gazebo. 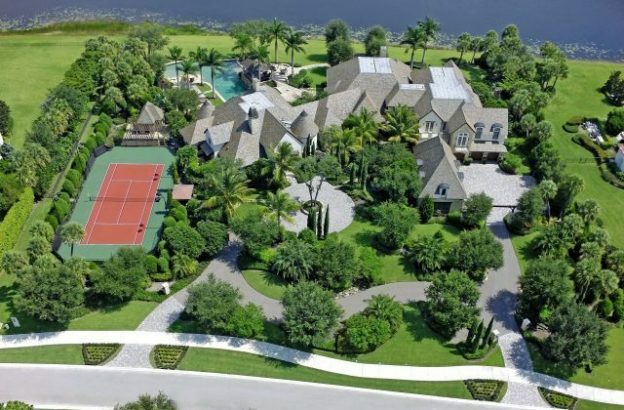 Sports Pavilion: Strategically located between the awe-inspiring resort pool and the competition motivated tennis facility, a free standing structure that pays homage to the architectural integrity of this magnificent estate with a replenishing drinking water fountain, beverage refrigeration, air conditioned storage and bath. Inspection is by appointment only with twenty-four hours notice and an accompanying letter of Buyer capability from a United States bank. 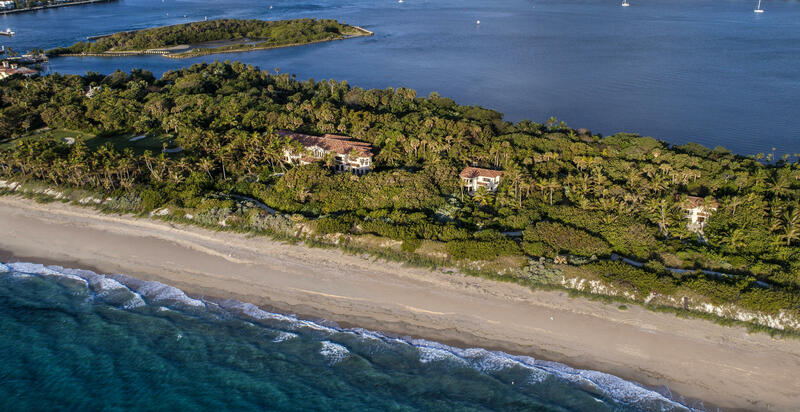 This entry was posted in Active, Boca Raton Oceanfront Estates For Sale and Delray Beach Luxury Real Estate Listings, Today's Featured Homes on November 4, 2013 by AgentImage.